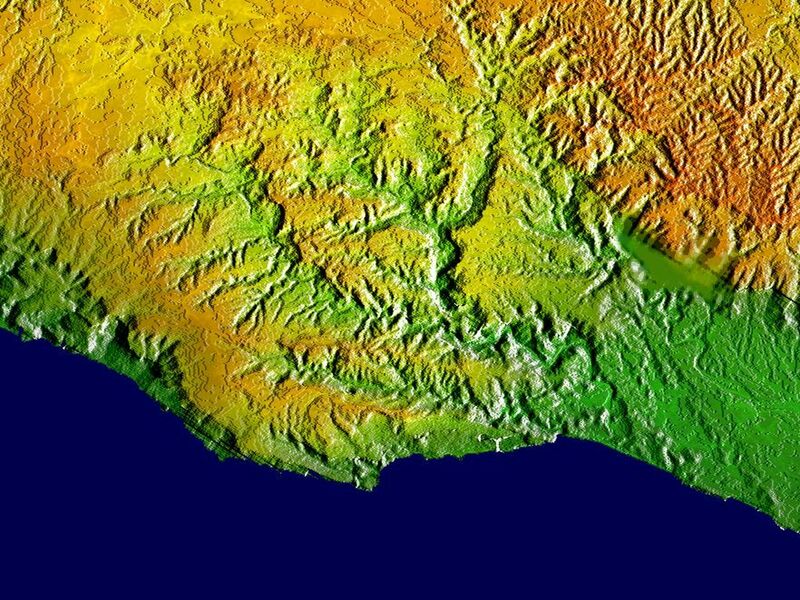 This elevation map shows a part of the southern coast of the Arabian Peninsula including parts of the countries of Oman and Yemen. The narrow coastal plain on the right side of the image includes the city of Salahlah, the second largest city in Oman. Various crops, including coconuts, papayas and bananas, are grown on this plain. The abrupt topography of the coastal mountains wrings moisture from the monsoon, enabling agriculture in the otherwise dry environment of the Arabian Peninsula. 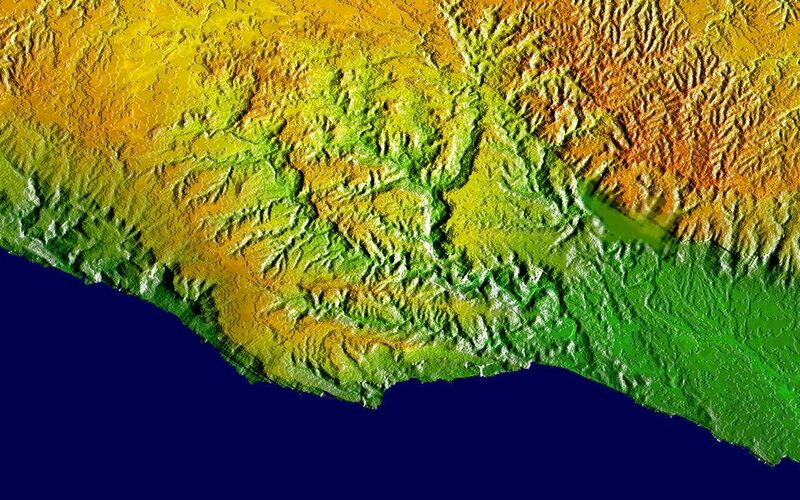 These mountains are historically significant as well: Some scholars believe these mountains are the "southern mountains" of the book of Genesis. 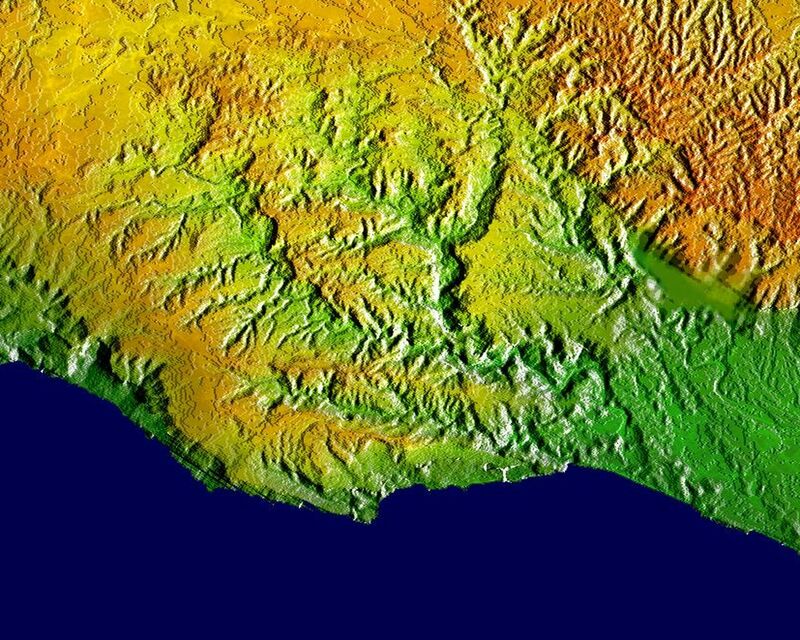 This image brightness corresponds to shading illumination from the right, while colors show the elevation as measured by the Shuttle Radar Topography Mission. Colors range from green at the lowest elevations to brown at the highest elevations. This image contains about 1400 meters (4600 feet) of total relief. The Arabian Sea is colored blue. The Shuttle Radar Topography Mission (SRTM), launched on February 11, 2000, used the same radar instrument that comprised the Spaceborne Imaging Radar-C/X-Band Synthetic Aperture Radar (SIR-C/X-SAR) that flew twice on the Space Shuttle Endeavour in 1994. The mission was designed to collect three-dimensional measurements of the Earth's surface. To collect the 3-D data, engineers added a 60-meter-long (200-foot) mast, an additional C-band imaging antenna and improved tracking and navigation devices. The mission is a cooperative project between the National Aeronautics and Space Administration (NASA), the National Imagery and Mapping Agency (NIMA) and the German (DLR) and Italian (ASI) space agencies. It is managed by NASA's Jet Propulsion Laboratory, Pasadena, CA, for NASA's Earth Science Enterprise, Washington, DC. Location: 16.9 deg. North lat., 53.7 deg. East lon.